Ironically enough, both of these respective brand labels will be owned by the same parent company, Electrolux. Ultimately making them sister companies. One of the oldest known appliance brands (since 1907), GE Appliances was sold off to Electrolux last September (2014), for $3.3 Billion, making Swedish owned Electrolux one of the biggest appliance manufacturers in the world, doubling their U.S. sales. Part of the deal, included the iconic GE Appliance name, which will remain. General Electric has always been and will continue to be, a common household name. Their product diversity seems to be never ending. In the appliance category, GE has a number of different series that range from a “value brand” to a “luxurious brand”, including: GE, GE Artistry, GE Profile, GE Café, GE Slate and their high-end, GE Monogram. GE has always been a “builder driven” product. More often than not, GE appliances will be found in new housing or building developments and is mostly builder driven. Profile is a 20 year old sub brand of GE and their number 3 line after Café and GE Monogram. To some extent, Profile is a forgotten line because GE has focused mostly on selling the appliance division. To be transparent, we stopped selling GE years ago. Frigidaire is an American brand of consumer and commercial appliances, also founded in the early 1900’s. Their early claim to fame was the development of the first self-contained refrigerator in 1916. The brand was always well known for their refrigeration, so much so, that during that era, all Americans referred to all refrigerators as Frigidaire’s. In the 1990s, Electrolux purchased Frigidaire and really was responsible for the stainless trend ongoing even today. Frigidaire also offers a few different series in their respective brand label: Frigidaire, Frigidaire Gallery and their elite line, known as Frigidaire Professional. The following is a comparison between the Frigidaire Professional gas slide-in range and the GE Profile gas slide-in range. True Convection - Single convection fan circulates hot air throughout the oven / the benefit, faster and more even multi-rack baking. Smudge-Proof Stainless Steel - Resists fingerprints and smudges / the benefit, it's easy to clean. PowerPlus® Clean - Heavy-duty self cleaning / the benefit, 25% more cleaning power. "My Favorite" Setting - Easily program your most used setting with the touch of a button / the benefit, ease of use. One-Touch Options - Our ovens feature easy-to-use one touch buttons / the benefit, cook pizza or chicken nuggets with a touch of a button, add a minute to the timer, or keep foods warm - with the touch of a button. Continuous Grates - Continuous Grates make it easy to move heavy pots and pans across burners without lifting. Heavy-Duty Grates and Professional-Style Knobs - The grates are sturdy and the professional style knobs will help you cook like a pro. ADA Compliant - This product is ADA Compliant. Both of these brands in their respective Professional and Profile Series are very comparable. They both have convection and have upgraded their burners over the last few years with GE topping out at 20,000 BTUs and Frigidaire at 17,000 and 15,000 BTU. The GE Profile will offer an additional cubic foot capacity in their oven and the 5th burner on the cooktop; because of this, they will offer more BTU power overall. 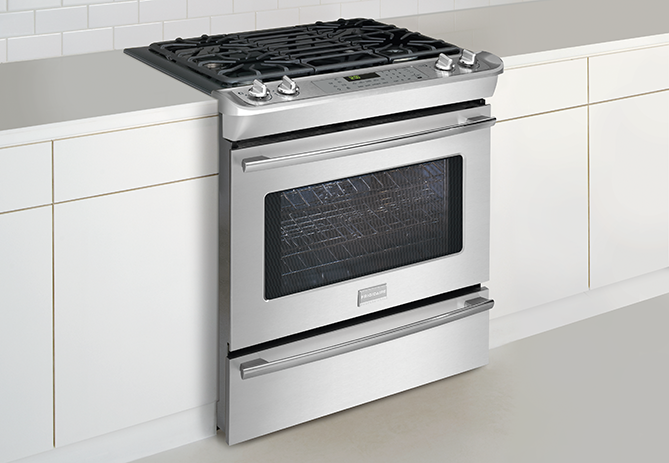 GE Profile also offers the same slide-in with a Double Oven option. The Frigidaire Professional is not as powerful and does have a smaller oven capacity, but it is $850.00 less in comparison with other package opportunity. We haven’t sold GE in a couple of years, but their reliability was decent. Frigidaire is one of the industry's most reliable brands, and is on our list for one of the most reliable in 2014. GE is technically slightly better in features, but Frigidaire may be a better value…what do you think? Get the Yale Appliance Buyers Guides with features, specs and inside tips to all the brands (and tons of pictures). Over 85,000 people have downloaded a Yale Guide.